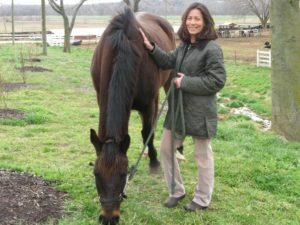 Diana Pikulski’s unwavering commitment to 825 ex-racehorses in the care of the Thoroughbred Retirement Foundation is, in part, an extension of her core belief in the sanctity of animal life, a powerful feeling dating back to childhood and a memory of lamb slaughter. She was 12 years old when she and her family visited a farm to buy ducks, and she unexpectedly saw lambs being slaughtered. Decades later, she vividly recalls the scene that changed her life. 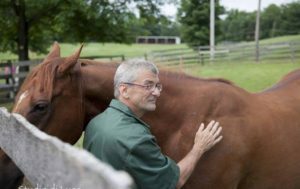 “I became a vegetarian after that, because once I made the connection between what I saw that day and the food on my plate, I said, this is not food for me,” says Pikulski, the Thoroughbred Retirement Foundation (TRF) Director of External Affairs. The lifelong animal lover did not set out to become the mainstay of the nation’s oldest and largest Thoroughbred charity. 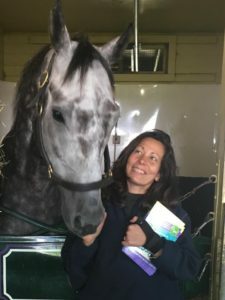 Though her childhood was spent riding horses, and she rescued her first from a New Jersey auction as a teenager, Pikulski had a practical career goal. After earning a degree from Vermont Law School, she became a private-practice attorney and public defender, doing both for a decade. In this week’s Clubhouse Q&A, Pikulski discusses the work and challenges in a career spent watching over the horses protected by the country’ oldest and largest Thoroughbred charity. After volunteering for 10 years, Pikulski closed her law practice and joined the TRF in 1997. And from that day on, she has held an integral role in the organization as it serves nearly 900 retired racehorses. Diana Pikulski has been a champion for the Thoroughbred Retirement Foundation and its horses for decades. What is the racing industry’s biggest challenge? The biggest challenge with aftercare is identifying and keeping track of the horses in need. There are so many people involved in this now; awareness has really grown among people in the industry. There are many people who are making sure the horse they own, train or breed, end up in a good place. But, there are still so many horses who fall through the cracks. There’s no legal process for tracking a horse once it starts in the business, so this is a real challenge. The racing industry has come a long way. Most racing jurisdictions now have aftercare programs. The TRF really stepped up early to try to help. 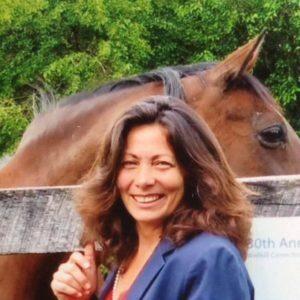 Monique S. Koehler was a true pioneer in the Thoroughbred aftercare world. We were a real experiment. We wanted to see how ex-racehorses would do, after their careers ended, and they were turned out to live in a herd. What we found is that they do great, even the ones that are only pasture sound. They live very happily, well into their late 20s and early 30s. The idea to save horses all goes back to Monique. She’s a totalanimal lover, and when she learned that there were tens of thousands of Thoroughbreds going to slaughter then, many more than end up slaughtered today, she couldn’t believe it. She read an article about a woman named Daphne Collins and her effort to try to find homes for racehorses whose racing careers had ended. The TRF’s prison/racehorse program Second Chances is something to see. You’ve talked about how amazing it is to see inmates and OTTBs working and learning from each other. I regularly visit our farms, and the horses and inmates are what keep me going everyday. When I’m trying to raise money for the Foundation, even though it’s hard to pick up the phone to ask sometimes, it’s these people and horses I’m thinking about when I do ask. I know there’s something really amazing taking place at these farms, and that horses who can no longer race are helping people and inmates in incredible ways. One of the many scenes of horse-human interaction that inspires Pikulski in her work at the TRF. What’s one of your best memories of watching the inmates interact with OTTBs? We used to have a juvenile detention center in Baltimore, and one time I was down visiting, and I looked out and saw all these young men walking around with their horses. They treated them like dogs. They’d walk them around with a lead shank on, taking them from one little spot to graze for another. Others were brushing their horses as they grazed, and the scene just struck me. They seemed so proud of their horses, and they spoke about them like they were their personal pets. They’d tell me about the ones they needed to keep separated because they were territorial and would kick at each other, and al the while, they’d be dragging these horses around this field, and the horses were totally happy to be dragged around with these boys, just out enjoying their day. You’ve said these relationships help make the case for the TRF’s value to donors. One of the keys to fundraising is to show donors the amazing things their contributions make possible. I love to take them out to visit our farms, so they can see first hand what we’re doing for the horse’s life, or in the case of our prison farms, for the horse and inmates. We’re a charity that is here for the horse’s whole life. Even if they get adopted, should anything go wrong, for instance, if the owner gets into financial trouble, or doesn’t do a good job taking care of the animal, we always take the horse back. Our commitment is to be with this horse for the rest of its life. So our costs, which includes running the entire organization, the farms, worker’s compensation, etc. makes fundraising and donations incredibly important. Our horse-care budget alone is $2 million a year. It sounds like a lot of money, but if you divide that by the roughly 825 horses we have, that’s approximately $2,500 per horse a year. That’s not a lot of money to take care of one horse. We try to be creative with our fundraising because there’s a thing called Sanctuary Syndrome, where people get donor fatigue. We try to make it interesting for them. This is why we’ve been offering donors a chance to sponsor an individual horse in the herd. Once people actually meet the horse they’re sponsoring, and they discover their unique, individual personalities, it gives meaning to the animal lovers who are helping our horses. We have a herd of about 825 horses. That’s 825 individuals with their own personalities. Every horse matters to us. When we get this across to people, they stay interested. What reasons do you have for optimism? There have been some real positive changes in the Thoroughbred industry to help take care of the horses. The Thoroughbred Aftercare Alliance, the Jockey Club and individual race tracks going back to Sam Elliott at Suffolk Downs, who accepted the reality that if the racing business is going to succeed, we have to take good care of the animals. I talk to people in the industry daily who are committed to figuring that out. The Thoroughbred Daily News and their ownership, the sales companies like Fasig-Tipton have been helping the TRF. I just see a positive change in how aftercare is thought of now. It used to be hard to convert people in the beginning. Now just about everybody is on board, and they want to make it work. And I think meeting the horses makes you realize that all these horses matter.